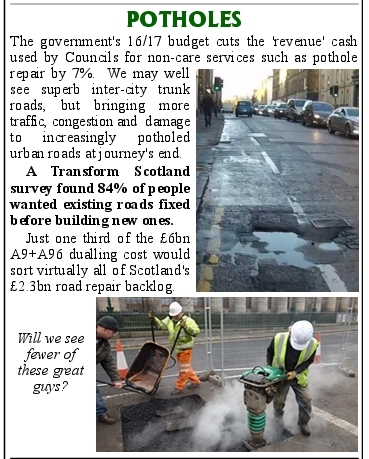 The same 7% cut means big cuts to council staff across Scotland – from which transport cannot escape. With a 2000 staff cut in Edinburgh there are rumours that the Council’s carefully built-up expert cycle team could suffer, delaying or putting at risk implementation of major cycleroute plans and of the many regular small but staff-intensive improvements such as dropped kerbs, signing, and the traffic orders often needed to enable cycling in one-way streets. Despite literally hundreds of emails to the Finance Secretary, many contacts with MSPs, support from the Cross-Party Parliament Cycling Group, and wide support from experts, funding for active travel remains unchanged in the final budget – and, as we have repeatedly pointed out, the way the cash is structured is likely to mean less cycling investment this year in the great majority of councils. Even our politically realistic proposal to transfer a mere 1% of the government’s ever-increasing £820m trunk roads budget to active travel was a step too far – though councils are expected to cut revenue budgets for purposes such as transport by 7%. Edinburgh Council has been increasing its investment in active travel year on year and as a result cycling rates are growing substantially. The next Scottish Government must learn from the Capital. Parties and candidates for the May Holyrood elections must be asked to support the call for 10% of future transport budgets to go to walking and cycling.